This was dinner on Monday night. Olive’s plate looked no different than ours, except I compartmentalized things so she could easily grab them. She ate one piece of tomato, one bean and all her fish. She tried and spit out one olive. We also gave her a cracker and after she ate half, she declared herself “all done.” That’s it! We didn’t ask her to eat more, we didn’t get upset that she wouldn’t try any more beans, although I know she loves beans and would like them. I wanted to but I didn’t. It’s a hard resolution but we have vowed to stop messing with Olive during meal times. I have resolved to respect her more and trust her to eat what she needs at the mealtimes provided. She only has one snack a day, between lunch and dinner, as we usually don’t eat dinner until 7 or 7:30, and so for the most part, she is hungry at meals and will eat. Lately, because she’s not growing as rapidly as she did around a year-18 months, she doesn’t have a big appetite. She is fine after a few bites and will declare herself finished, sometimes way before I believe she’s had enough. But what do I know? And how exactly do I know how hungry she is when she is probably a tenth the size of me? I have seen that when she knows she’s not going to be messed with, she acts more controlled, more independent, and she is more focused on her meal. On the contrary, when she feels watched, observed (it’s hard not to look at a kid while they’re eating), she immediately starts acting out. She drops things and bangs her spoon on the table and tries to get out of her chair, and if I’m honest, it’s probably because she doesn’t want to eat with someone who stares at her every move and intimidates her to take “one more bite.” Would you want to eat with one person like that, much less two?! 2. Variety is offered, along with something she recognizes. 3. I serve the new thing to her first, and we all eat a little bit of it together as a “first course,” if you will, because what kid is going to eat Brussels sprouts when there’s chicken on the table? 4. After the new food is presented and at least tried (she doesn’t have to eat much of it, just a taste), then I bring out the rest of the food, I put a little bit of each thing on her plate, explain what everything is, and then back off. 5. No distractions during meals – no toys (well sometimes the stuffed animals eat with us, but they’re not used as a distraction from the food), no toys, a.k.a. iPhones for me and Matt, no answering texts or calls. This helps. It really does. Because as soon as Olive spots a phone, she wants it, or suddenly becomes dissatisfied with her sitting-down-and-not-playing-instead situation. We try to engage her in our conversation, as well as encourage her not to shout during ours 🙂 It’s a growing and a learning process and more often than not, it does NOT go perfectly, but I think it’s the consistency that is the key. 6. If there’s dessert, you don’t have to do anything special to get it. Not even eat all your vegetables. You simply have to wait for everyone to finish. So, if Olive eats just a bit of dinner, but not much, and I have already planned on serving a dessert, I do NOT tell her she needs to eat more before she can have it. She can have it if she stays at the table. If she wants to get down, she can, but if she wants dessert, she must come back, sit down and be civilized to get it. Dessert must not be contingent on her being a “good girl” or eating her “bad broccoli.” If I could banish one crippling habit in the world, it would be our habit of calling foods “good” or “bad” and rewarding or punishing ourselves accordingly. 7. We eat together. She doesn’t start first just because she’s hungry. She waits. And then we all sit down together. This teaches respect, patience, and a realization that she’s not the only one that needs consideration. So before you declare yourself or your kids a failed attempt before even trying, let me remind you that Olive very often doesn’t like what I serve. She very often will only eat one of four things presented. Sometimes she shocks me and eats EVERYTHING, including the stinky cheese. But this is rare, and yet I let it be a glimpse and a proof that she likes food, she just doesn’t always want a lot of it. For the sauce, heat half the oil in a medium pan and fry the onion for 5 minutes, or until soft. Add the peppers and fry for 2 minutes. Add the tomatoes, tomato paste and olives and season with salt and pepper. Bring to a boil, then simmer, covered, for 10 minutes. Add the beans and dill and heat for about a minute. Set mixture aside. Heat the remaining oil in a non-stick skillet over medium high heat and cook the fish about 2-3 minutes per side, until a nice golden brown is on each side. 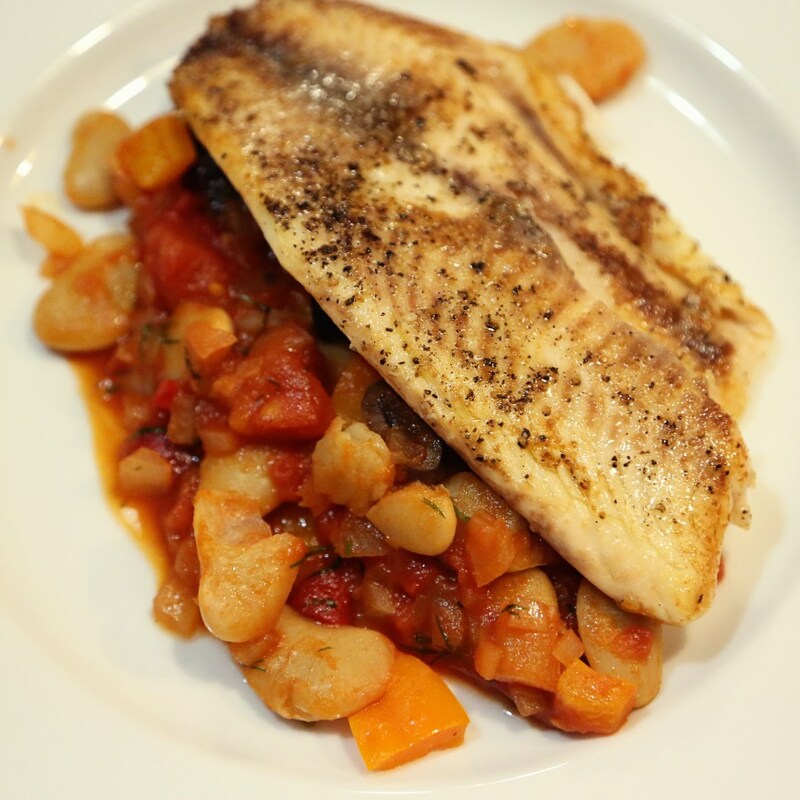 Season with salt and pepper and arrange fillets over the tomato/bean mixture and serve with extra dill and a side of bread – dinner is served! 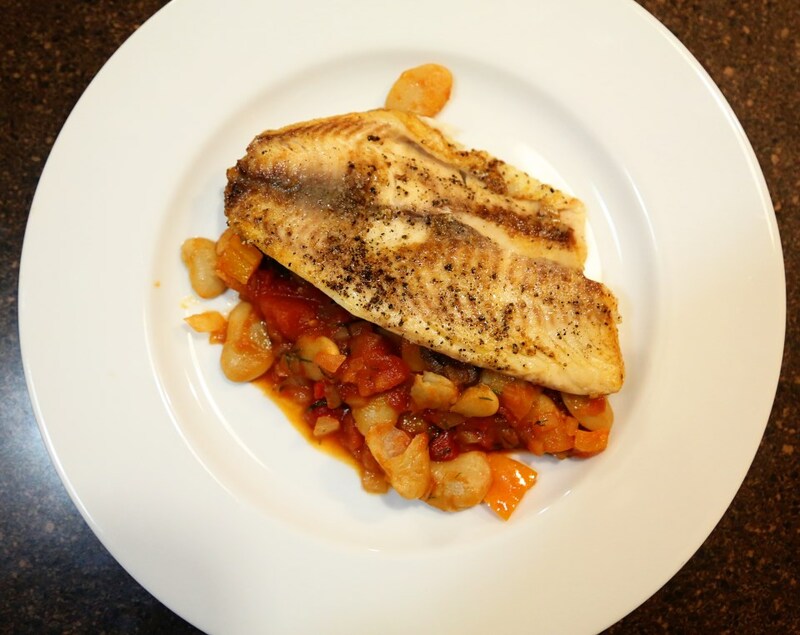 This entry was posted in Children, Cooking Tips, Fish, Healthy Meals, Musings, Uncategorized and tagged beans, butter beans, easy meals, fish recipes, healthy meals, sweet pepper, tilapia, tomato, weeknight meals, white fish. Bookmark the permalink. This is pretty much how I was raised. We turned out healthy eaters and never developed any “picky” habits. When I ask Mema how she did it? She simply says, I didn’t do anything special. I fixed supper and if you were hungry then you ate. On a side note, even though we don’t have kids I have a no phones at the table rule. I think it’s a distraction from the food and the company. Every family should have one meal a day together at the table without their “toys” and pay genuine attention to one another. It makes me sad when you go out to eat and see a family around a table and they are all staring at their phones! I’m proud of you and I love this post! Thanks for the comment, Becky! I love your Mema’s blunt response! We were raised this way, too – it’s just our generation for some reason, became short-order cooks somewhere along the way. Or maybe some of us just aren’t used to eating together. I know we always had meals at the table each night, even when I was in high school, (and my mom worked all day!) but I know plenty of friends whose families just each ate their own thing, did their own thing, ate dinner standing up in the kitchen, whatever. I think along the way, the art of communion got lost in what used to be the only time of the day we had to talk (or fight, haha). And, a lot of our generation had mothers who worked all day and took FULL advantage of fast, quick and easy food, and I don’t blame them at all, but I think with just a little extra forethought, a few quick meals can be planned out ahead of time. Doesn’t have to be fancy – anything at the table is better than a dozen things handed to you from a drive-thru window! Yes! I like the idea of trying the new food together. Our girls are 13 and 7. I still do my best to trust that they will eat when they are hungry. One eats a tiny breakfast and huge dinner. The other eats a huge breakfast and tiny dinner. It all evens out. Best wishes for happy dinner adventures! You are so right! It does even out and if you just go with the flow and remain consistent, things are much less stressful! Thanks, again, for reading my blog! This is great! I struggle so much with feeding Coleman and have little control over what he eats during the day. But, our family schedule has shifted so now Scott gets home earlier and C goes to bed later, so if I can get my act together and get home on time, we may all get to eat as a family (at least some nights). Thanks for the inspiration! I’m so glad your schedule shifted a bit, Sara! I know my situation is ideal and I don’t take it for granted! Just today, though, Olive ate ZERO bites of lunch. I mean zero. Chewed on a piece of turkey and spit it out. Chewed on a piece of awesome butternut squash mac and cheese (yeah, it’s great) and spit it out. Ate a dab of mustard off her finger and called it a day. I gritted my teeth and said okay! Try again at dinner! It’s hard so many days, but I really think sticking to the rules in your head and not getting flustered is the key. And, as I’ve seen, kids who eat junk food still grow up just like kids who eat the perfect diet all the time. I think it’s just the relationship with food that I’d like to improve with this generation!